Race to the foot of the mountain, collecting prizes and bonuses to rack up as high a score as you can! Earned by completing the run without hitting an obstacle. Awarded for completing the run within a set time. Collect multiple prizes in a row to increase your score multiplier. The multiplier will reset if you hit an obstancle, or if too much time passes before you collect the next prize. Replay the game until you've found all the treasure prizes for a special reward! 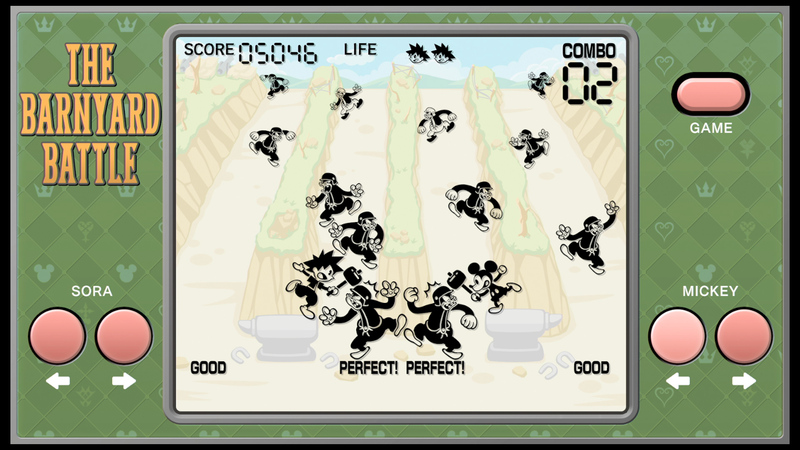 Based on The Barnyard Battle from April 25 1929, you are tasked with helping Sora and Mickey defend the home of the mice from Pete. Use mallets to thwack Pete the Cat but be cautious! The more you hit Pete, the faster more of him will come. Find a rhythm and time your attacks just right! 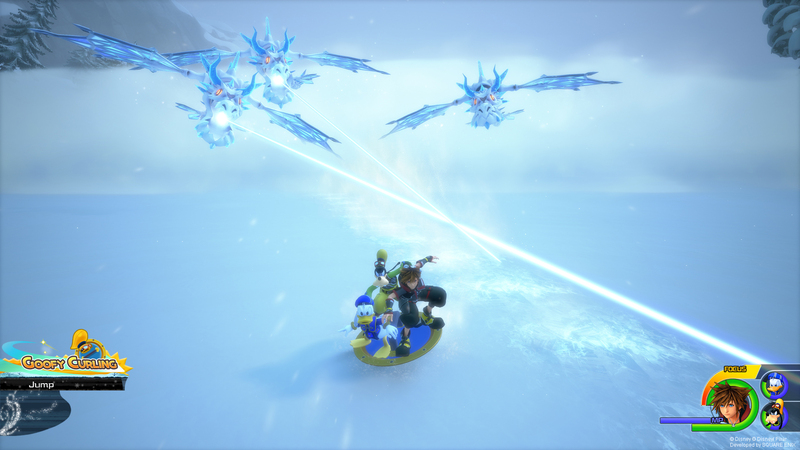 You want to hit the baddies just as they move next to Sora and Mickey. Based on Giantland from November 25 1933, you are tasked with getting Sora safely away from the giant Rumplewatt and into the safety of Mickey Mouse. Use Rumplewatt's strength against him and work your way up the table to the lights in order to escape out the window, but be careful! Time your moves carefully so you don't get hit by Rumplewatt's feet or hands. 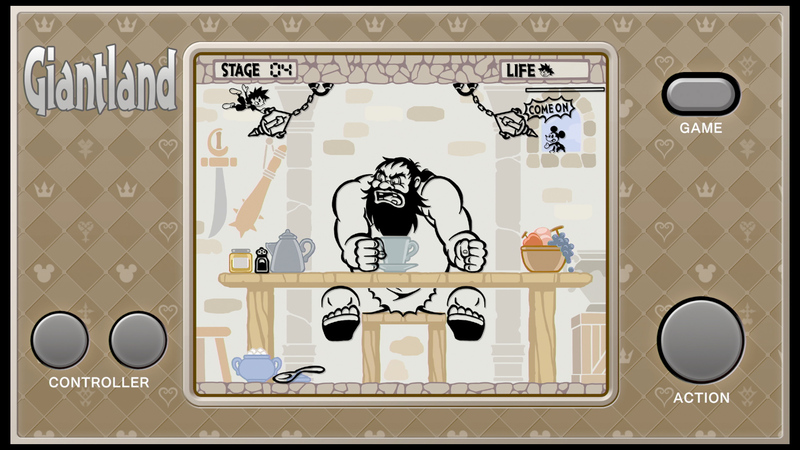 Avoid the giant's attacks and escape the room! Reach the window where Mickey is waiting and you're home free! Based on The Karnival Kid from May 23 1929, you are tasked with helping Sora fulfil the orders of various Disney Castle residents. 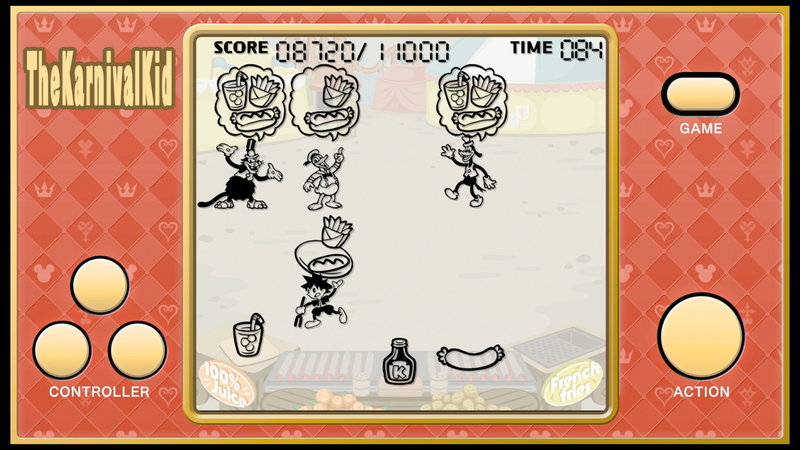 Collect hot dogs, buns, drinks, and condiments to ensure Clarabell, Horace, and everyone else is well fed. Don't get their order wrong or your days as a waiter will be short lived. Deliver each customer's food order correctly! Don't overcook the hot dogs! If you see three smoke trails, that means they're cooked just right. Based on Musical Farmer from June 9 1932, you are tasked with helping Sora collect eggs from chickens. Collect up to six eggs in a crate and deliver the baskets to either Mickey Mouse or Minnie Mouse. Remember to bend the pipes to ensure the eggs make their way down to the crates below. Don't let the crates get too full or the eggs will break. Ensure there are up to six eggs in a crate before handing them off. Use the eggs collected in the middle crate to fill up the baskets on the side and deliver those to your friends. Game B removes the middle crate for added challenge. Use the left and right crates to catch the eggs that fall from the middle tube, but remember to put the crates back otherwise you'll find yourself with more egg shells than you know what to do with! Move up to the pipe fittings and press <ACTION> to rotate the fittings. You want to guide the eggs safely into the crates. 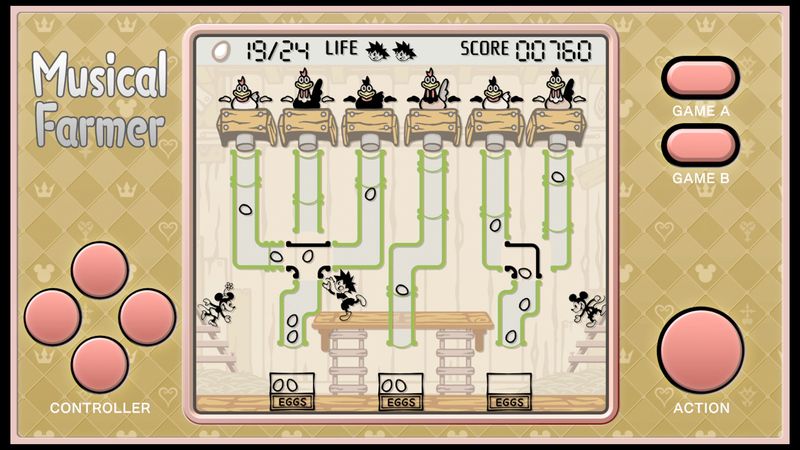 Based on Fishin' Around from September 25 1931, you are tasked with helping Sora and Mickey catch some fish in the lake. But watch out! Vicious fish will appear in the background and inch closer and closer to Sora and Mickey. 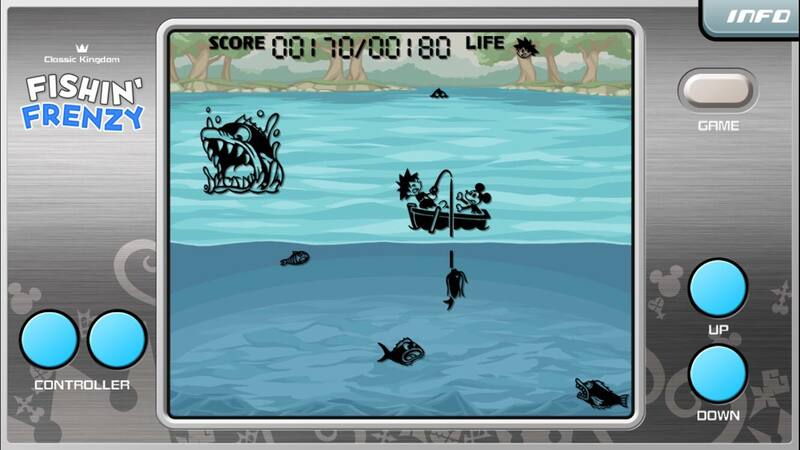 Move out of the way to avoid being eaten while catching fish of your own! Use <UP> and <DOWN> to raise and lower your fishing hook. Once a fish bites, rapidly press <UP> to reel it in. Jumbo fish are closing in on you from the back of the screen. Use <Move Left><Move Right> to move the boat and get out of the way! The moogles have tasked Sora with taking photos of enemies, landmarks, and characters all across the worlds! Track them down and get some good rewards, kupo! Fluffy doesn’t always mean cute, kupo. I can’t get over those chiselled muscles, kupo. Mechasmasher’s busting through the wall, kupo. The moogle must want a picture of Rapunzel’s Tower. “King of the gods” to some, “Dad” to others, kupo.